Bounty Lime Rum | Caribbean Rum | Rum from St. Lucia | Flavoured Rum — Emporia Brands Ltd.
Bounty, "The Spirit of Saint Lucia" was established in 1972 as the principle rum brand of St. Lucia Distillers, a united venture created when the last two distilleries on the island, the Dennery Distillery and Roseau Bay Distillery merged. It is now by far the number one rum sold in Saint Lucia, but has never been exported off the island! 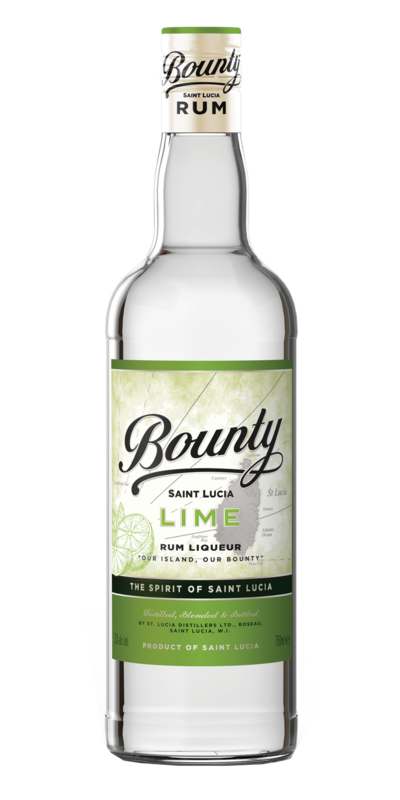 Bounty Rum is an authentic heritage rum representing quality and value Saint Lucian's have come to expect when they are "enjoying the finer life" as they very often say. Bounty rums are a blend of double distilled rums from Guyanese molasses, aged for 2 years in ex-Bourbon casks. They are medium bodied and found to be clean with well-bal- anced tropical flavours and a soft finish - ideal to be enjoyed in your favourite cocktails. Bounty Lime is made from Bounty White Rum, natural lime sugars and flavours which are macerated with the rum at high strength. The rum is then diluted with distilled water and sugar to create Bounty Lime. Nose: Zesty, citrus lime notes with tropical floral aromas. Palate: A wonderful and refreshingly smooth mouth feel with explosions of zesty lime citrus and tropical floral aromas.